When you want something different, something they've never seen before. When you want to create an unforgettable experience that leaves your team or members with lasting motivation and your specific calls to action that stick. When you want an event to flow effortlessly, have a throughline of Energy, Class and Excitement. When you want them to be entertained, laugh, be PART of the event, not just talked at or demonstrated to, but interacted with and included. When you want your audience to have their networking and engagement amplified. Lynn Rose is one of a kind in her ability to bring audiences to their feet, on fire, inspired and leaping to action. She utilizes her skills as an Energizing Entertainer, Fun and Purposeful Emcee, Interactive and Inspiring Keynoter and her brilliant Breakouts to create the WOW Experience for events, helping individuals and organizations achieve world-class performance in their business goals, their events, their speaking and their lives - which is proven to impact personal and bottom line growth. "Get Positioned As a Leading Entrepreneur or Expert with WOW Results!" "Discover the dynamic, ALL IN ONE added-value difference to create an unforgettable event." "You Hold The Power To WOW! "How to WOW! - Breakthrough to WOW Performance in your Speaking and Presentations"
PRESENTATION SKILLS TRAINING: "How to WOW! - Breakthrough to WOW Performance in your Speaking and Presentations"
What is A “PERFORMANCE KEYNOTE”? The KEY to a message sticking and having lasting power is interactivity with the attendees and turning their time into an experience. an unforgettable experience that anchors lasting inspiration and ignites peak performance into your audience. Lynn uses passion, heart, humor, powerful stories, game-changing tools, even science, along with music, so your team or members can be infused with the power to achieving world class performance. Truly unforgettable, exciting, inspiring and most of all, paradigm-shifting. From that moment forward your attendees are instilled with the Power To WOW, on fire, inspired and excited to take massive action. This is Lynn’s Signature Keynote infused with humor, heart and harmony to bring out the WOW Performance in all in attendance. Ready to have your company leap into even greater success in the most fun, out of the box, interactive, entertaining way that leads them to achieving “WOW Performance”? Seen on CBS, and other top TV networks, on film, Broadway and more, Lynn has motivated corporate and concert event stages across the world. Lynn Rose is the secret sauce for many industry leaders, having helped launch 6 and 7 figure careers, along with empowering companies, with her media and marketing expertise and her motivating call to action message, interwoven with music as a source for taking the message deeper, providing real world results while creating a powerful, entertaining, motivating experience for your company’s event. Lynn gets YOU and your organization on fire to play your biggest game ever while being massively entertained and moved! She’s shared the stage with Sheryl Crow, Mariah Carey or Jay Leno. She’s led her WOW breakthrough performance keynotes and trainings for billion dollar CEO's, entrepreneurs and professionals, Lynn's #1 commitment is to leave your attendees on fire, inspired and ready to take action. 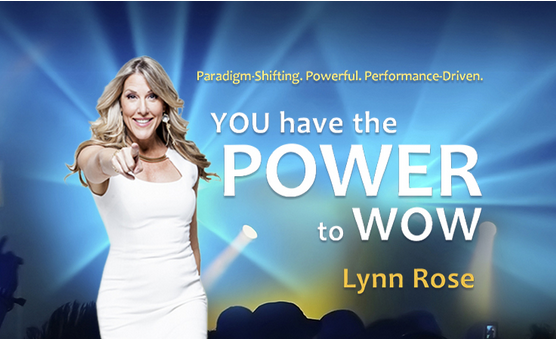 For over a decade Lynn has brought her game-changing Training, "The WOW Factor" around achieving Speaking Power through the power of your presence and connection, using her “WOW Performance approach to speaking”. Lynn can illustrate in one presentation her SPEAK Formula that leaves the audience in awe seeing volunteers transformation in minutes and what the attendees can do so that they, too, WOW whenever they speak. If you know how to connect authentically, with conviction and passion and speak confidently, you can have a homerun with your presentations no matter what. Master and beginner alike, WOW Factor's profound and one of a kind process has transformed billion dollar CEO's, speakers, authors, top professionals, entrepreneurs, even experts featured in the movie, “The Secret”, to those just starting out seeking a way to launch forward powerfully and quickly. Celebrity endorsements include billion dollar CEOs, legendary speaker, Denis Waitely, All time non-fiction #1 best-selling woman author in the world, Marci Shimoff, Producer of "What Dreams May Come", Barnet Bain, Producer/Creator of "MacGyver", Bill Froehlich and many more. There’s no more time to waste, getting less than desirable results, when you can breakthrough in the freedom, power and effectiveness of your speaking, presence and communication. When you do, you know how to WOW. "LAUNCH YOU NOW - How To Get Positioned As a Leading Entrepreneur or Expert with WOW Results!" It doesn’t matter where you are now, even if you’re just starting out, you have the ability to accelerate your path of success as an entrepreneur, at quantum levels, IF you know how to harness the power of FOUR ESSENTIAL Elements you need within your marketing and positioning of yourself. Lynn Rose, The Voice of Transformation in Media and Marketing, is responsible for helping launch 6 and 7 figure careers. In this dynamic, interactive, hands-on presentation, she shares with you the exact strategy and system of her Launch You Now Done FOr You service that has helped eliminate the learning curve and get clients filling their coaching programs right away, getting seen for their own shows on NBC and other networks, becoming #1 Bestselling Authors, magnetizing high-end clients and building successful, solid businesses. All this (and more) can happen for YOU, too. You just need to know how to connect all the dots in the right way….for YOU. Lynn Rose takes you step by step through the EXACT same Launch You Now Process she takes her clients through so YOU can know the nuts and bolts of exactly what you need for marketing success as an entrepreneur and/or expert. This training is INTERACTIVE, Engaging, Heart-centered and Mind-blowing with the crucial nuts and bolts you need. Some may be chosen for HOT SEAT coaching to illustrate the principles in action and take the learning deeper. Also included and demonstrated will be powerful Before and Afters that will shift your mindset with what’s possible for you. If its time to stop spinning your wheels and time to get the fastest, most effective and abundant way to where you want to go with your message, product or service, then this training is a MUST for you! Don’t just hire any Emcee, Discover the dynamic, added-value difference to create an unforgettable event. Hire Lynn as your Emcee who knows how to be the perfect through-line for your event, keeping your attendees engaged, on the edge of their seat, awake and on fire and inspired. When you hire Lynn as your Emcee, you also get her to infuse music where needed to get the energy going. Lynn is famous for being the “Energizer Bunny” for your event. She also has the sharp mind of an entrepreneur and media and marketing CEO and can help anchor in important points of your event or offerings, helping to activate in your audience the courage and motivation to take the action you want them to take. Do you want electrifying entertainment to get your audience excited and happy and having the time of their lives? Perhaps you want a pre-show the night before before Lynn’s Keynote the next day that’ll get your attendees all the more excited about the next day’s event while having a night they’ll never forget . that entertains your attendees to keep them engaged for the awards and creating a lifetime memorable evening . Perhaps as the secret sauce for kicking off your conference and electrifying, energizing and enlivening your audience so they can have positive association to your organization and have their hearts and minds opened to receive the information deeper the rest of the day. Whatever you choose, Lynn Rose knows how to galvanize any crowd into raving fans, happy and excited, while touched at their hearts, inspired to have FUN, feel energized and on fire. Do you need a Dynamic, Energerizing Headliner that gets your attendees on fire, inspired and ready to take action? Do you need a Powerful Emcee that is quick thinking on her feet, instantly engaging, anchors in your messaging even deeper and brings added value to WOW your event and make it the perfect throughline? How about a well sought after Dynamic KeyNote Speaker with her entertaining, empowering message, specifically customized for your group that creates an unforgettable experience and lasting WOW impact? And, what about a combination of ALL THREE as many other corporations choose for their events??? Please contact us for a list of quotes depending on your needs. We’re honored to serve you and your group. Get ready to be inspired! Lynn Rose is truly ‘The Voice Of Transformation’ She instantly lights up any room she enters and as a performer is electrifying and powerfully motivating. She is the ONE choice to guarantee the biggest WOW you’ve ever experienced. Lynn Rose is the ultimate professional. She has the uncanny and priceless ability to light a crowd on fire and leave them on their feet cheering, inspired and grateful for the experience. I can’t imagine doing an event without her! Lynn has entertained and motivated audiences around the world. To see what Lynn can do with your audience, check out this extensive video highlight of Lynn doing what she does best! Find Out How Lynn Can make Your Next Event A Wow!